Inspired by the Viking and Norse shields of old, the Round Viking Crimson Sun Wooden Shield is a classically shaped shield that features an original design. Not only is this unique shield decorative, it is also totally functional. This striking shield is hand-painted to feature a simple yet attractive Viking inspired sun design. The design consists of a series of interlocking fin-like blades that, together, form a shape reminiscent of a saw-blade or a fiery circle. The design is entirely crimson in color and is set against a vivid white background, which helps the design visually pop. The border matches the color of the design and is lined with stainless steel studs. The shield measures approximately 20 inches in diameter, making this shield a good mix between maneuverable and appropriately sized. It is made from 0.5 inch thick smooth composite wood, which features more strength and durability than can typically be found in traditional plywood. Dual leather straps are located on the back of the shield and allow for the shield to be carried, worn, and used with remarkable ease. One strap wraps around the forearm while the other strap is gripped securely in the hand. Several coats of topcoat varnish have also been applied to the front of the shield, in order to help protect it from whatever wear and tear it may experience over time. 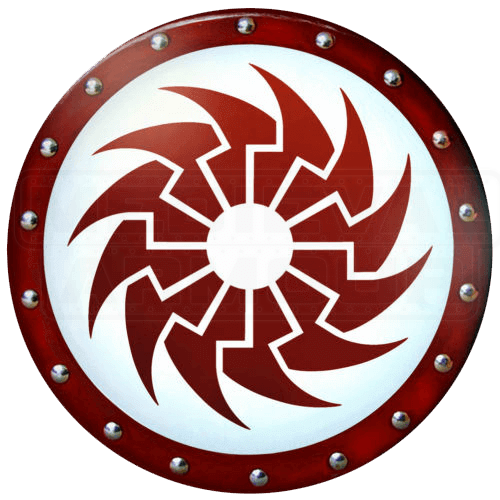 The Round Viking Crimson Sun Wooden Shield is the perfect shield to take to an upcoming Renaissance Fair in your area or to use during some friendly backyard brawling. You can give it as a fantastic gift to any die-hard medieval and Renaissance-enthusiast that you might know.